This is the highest peak on Mission Ridge. 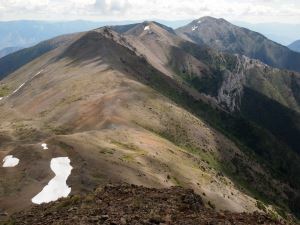 It's located 7 km northwest of Lillooet near the east end of Mission Ridge. A series of microwave towers dot the summit. It's best approached from dirt roads to the east and northeast. Name Notes: Note that on the 1:50K map the name "Mount McLean" is randomly placed near mission E3. However this is the highest point, so we designated this as the true summit of McLean.